Many Americans struggle with saving money. In fact, 58 percent of adults have less than $1,000 in a savings account, according to GOBankingRates’ annual savings survey, with the most common reason being living paycheck to paycheck. However, there’s a lot more at play that’s leading to such a low savings rate. In a new survey, GOBankingRates partnered with CIT Bank and set out to learn more about Americans’ savings habits. 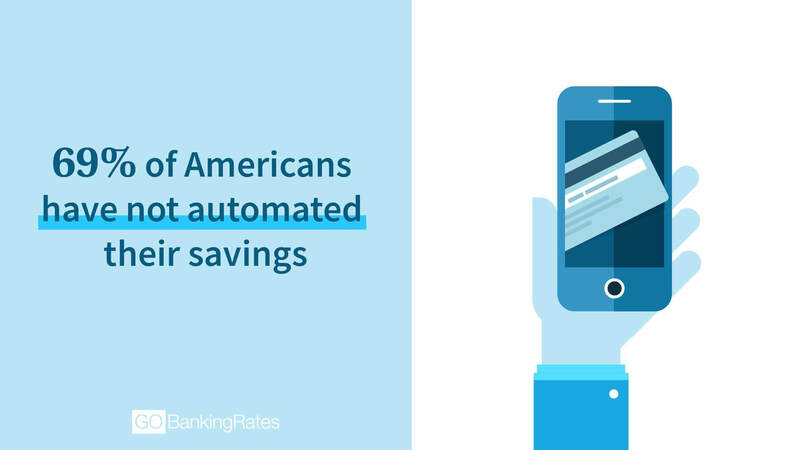 GOBankingRates polled 500 people to find out what types of bank accounts they have, their savings goals and how they set aside money in savings. Unfortunately, the survey highlights one major reason why Americans might be having trouble growing their savings. The survey found that 69 percent of respondents haven’t set up automatic transfers from their checking account to a savings account, which is one of the most effective ways to grow savings. Keep reading to learn more about what Americans are doing wrong and right when it comes to saving money. Although previous surveys have found that most Americans aren’t setting aside enough, this survey found most people do recognize the value of saving. However, only 19 percent said they were saving enough to meet their goals. On the other hand, nearly 33 percent of respondents said they should be saving a lot more to reach their goals and 24 percent said they should be saving a little more. Another 24 percent said they didn’t even know whether they were saving enough or not. Americans are doing even worse when it comes to building an emergency fund to cover unexpected expenses. The survey found that only 16 percent said they are saving enough for emergencies, whereas 37 percent said they should be saving a lot more. About 24 percent of respondents said they don’t know whether they’re saving enough, and 22 percent said they should be setting aside a little more for emergencies. Men are more likely than women to believe that they are on track with their savings. The survey found that 22 percent of men versus 17 percent of women said they are saving enough to meet their goals. And 20 percent of men compared with about 14 percent of women said they are saving enough for emergencies. Adults 65 and older are the most likely of any age group to believe that they are saving enough to meet their goals. On the other hand, adults 35 to 44 years old have the smallest percentage of respondents — about 8 percent — who said they are saving enough. Survey Question: When thinking about your overall savings goal, and the future plans you have for those savings, which of these is closest to how you feel? A majority of respondents have not set up automatic transfers from a checking account to a savings account. Most aren’t taking advantage of a high-yield savings account. Many also aren’t utilizing higher interest rates typically offered by an online-only bank. 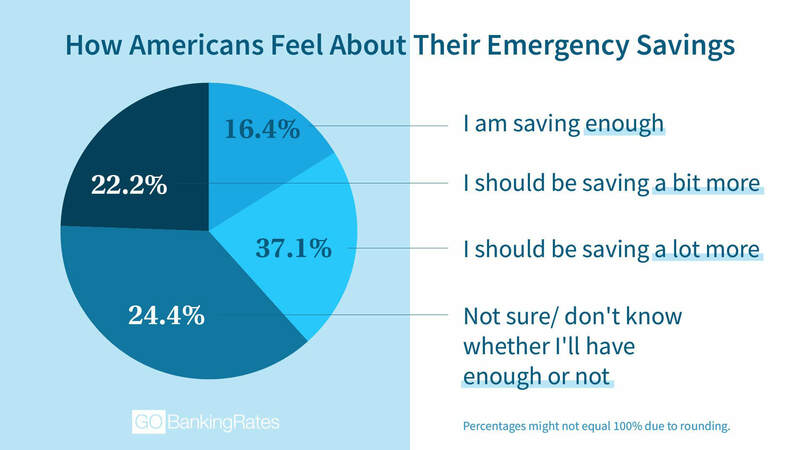 And most respondents don’t have an account dedicated to emergency savings. This, along with the other savings strategies Americans aren’t taking advantage of, could be contributing to the low savings rate in the U.S. However, these powerful ways to grow savings can really have an impact on helping people reach their goals. One of the biggest opportunities that most Americans aren’t taking advantage of to grow their savings is automatic transfers. According to the survey, 69 percent of respondents said they have not set up automatic transfers from their checking account to a savings account. Women are less likely than men to have set up automatic transfers — 72 percent versus 65 percent. And millennials ages 25 to 34 are the least likely of any age group to be using automatic transfers; nearly 76 percent aren’t using this strategy to build savings. Automatic transfers are a simple trick to save money because they ensure that cash gets set aside each month before you have a chance to spend it. Log onto your checking account online to see if your financial institution allows the option to set up recurring transfers. If so, set up a transfer from checking to savings to coincide with your paycheck. A great way to boost your savings is to take advantage of a high-yield savings account. However, only about 6 percent of survey respondents said they have a high-yield savings account, which would help their savings grow at a faster rate. 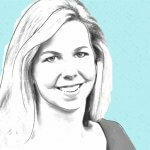 Again, women are less likely than men to use this strategy to grow savings. The survey found that only 4 percent of women have a high-yield savings account compared with 8 percent of men. Adults 65 and older are the most likely to have a high-yield savings account, followed by millennials ages 25 to 34. 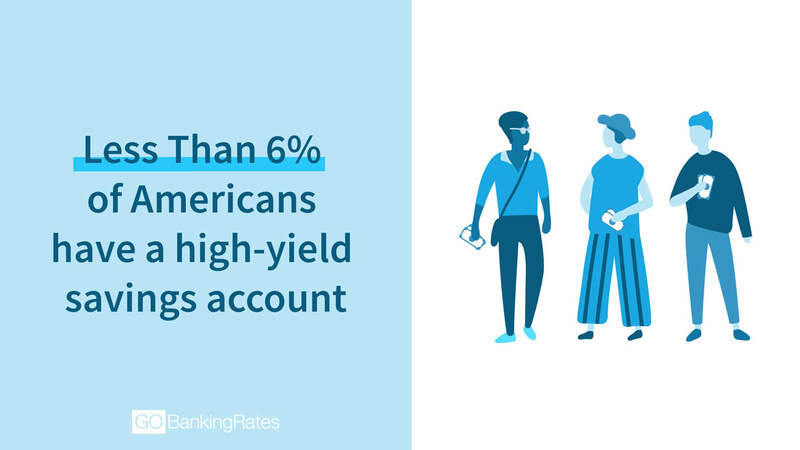 Most Americans also aren’t taking advantage of other accounts that offer higher interest rates than checking accounts and standard savings accounts. The survey found that 10 percent of respondents have a money market account, and just 6 percent have a certificate of deposit account. When asked what the highest interest rate is on their accounts, respondents said 2.05 percent, on average. That’s surprising considering most respondents don’t have a high-yield savings account. The average rate on savings accounts in the U.S. is just 0.09 percent, according to the Federal Deposit Insurance Corporation. Savers can get a much better rate by taking advantage of an account such as the CIT Bank Savings Builder, for example, which lets account holders earn up to 2.45% APY. The survey also found that only 8 percent of respondents have accounts with an online-only bank. One of the pros of online banks is that they tend to offer higher interest rates on savings accounts because they have lower overhead costs than brick-and-mortar banks. Not surprisingly, millennials ages 25 to 34 have the highest percentage of respondents — 13 percent — with an account with an online-only bank. Younger millennials ages 18 to 24 have the least — just 5 percent have an account at an online-only bank. This age group is more likely to have an account at a local bank or national bank. Traditional banks do offer convenience and in-person customer service, which many Americans value. A separate GOBankingRates’ survey found that 49 percent of Americans prefer banking in person. But if you want to earn a higher rate of return on your savings, consider an online-only bank. Finally, a majority of Americans aren’t optimizing their emergency savings. The survey found that 66 percent of respondents don’t have a dedicated emergency fund account. It’s hard to reach emergency savings goals if you aren’t specifically setting aside money for that purpose in a dedicated account. Respondents ages 35 to 44 are the least likely to have a dedicated emergency savings account, with 76 percent having said they don’t have this type of account. And women are less likely than men to have an emergency fund savings account. About 69 percent of women said they don’t have this type of account versus 63 percent of men. An emergency fund can help you pay for unexpected medical costs, make car repairs, replace household appliances when they stop working, make ends meet when you lose a job or even survive a government shutdown. Having a stash of cash will ensure you get through tough times without having to go into debt, tap your retirement savings or rely on family and friends to help you out. If you know you need to save a lot more to reach your goals, there are plenty of money saving tips that can help. Start by examining where you’re banking and what types of accounts you have. Check if your savings or interest-checking accounts have high fees that are eating away at your savings. And compare the interest rate on your accounts with those offered by other financial institutions. You might be able to grow your money faster by switching to a high-yield savings account. Also, pay yourself first by automating your savings. Don’t know how much to automate from your checking to your savings? Start by tracking your spending to see how much of your money is going toward necessary and nonessential expenses. If you’re spending too of the money you earn each month, identify nonessential expenses to cut and have that amount automatically transferred to savings each month. Keep reading to find out which supposedly “tiny” fee is actually costing you over $10,000 in savings. Methodology: This survey was commissioned by ConsumerTrack, Inc./GOBankingRates in partnership with CIT Bank and conducted by Survata, an independent research firm in San Francisco. Survata asked 500 online respondents the following six questions: 1) When thinking about your overall savings goal, and the future plans you have for those savings, which of these is closest to how you feel? 2) What type(s) of bank accounts do you have? Select all that apply 3) What type(s) of financial institutions do you have accounts at? Select all that apply 4) Of the bank accounts you have, what is the highest interest rate/APY? 5) Have you set up automatic transfers from your checking account to your savings account? 6) Do you have a dedicated account to save for emergency expenses? The survey was conducted between Feb. 4, 2019 and Feb. 5, 2019. Respondents were reached across the Survata publisher network, where they take a survey to unlock premium content, like articles and e-books. Respondents received no cash compensation for their participation. More information on Survata’s methodology can be found at survata.com/methodology. Get your savings account in order for America Saves Week. Ally's best online bank accounts have high APYs and no fees.